Three weekly newspapers are set to close with the loss of six editorial jobs, it is understood. 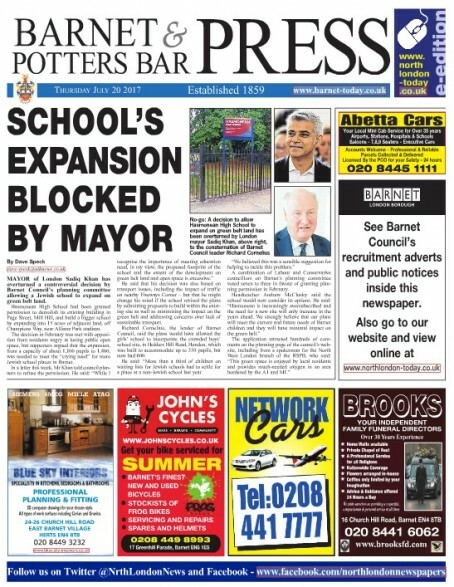 HTFP understands Tindle Newspapers is shutting the Barnet Press, Enfield Advertiser and Haringey Advertiser this week. A total of 16 jobs are thought to be at risk, including six journalist roles. All of the affected titles are based at offices on Baker Street, Enfield. No-one at Tindle was available for comment when contacted by HTFP this morning. The announcement to staff was made on Friday, and came in the same week that it was revealed group founder Sir Ray Tindle was stepping down from his role as chairman. Sir Ray has handed over the day-to-day management of the company to his son Owen. Last year Sir Ray sold a number of London titles to Capital Media in a management buyout – including the South London Press, the Mercury and the London Weekly News series. The company went into administration earlier this year – but the SLP was sold earlier this month to a new owner, Romford-based leaflet distribution firm Street Runners Ltd, after being placed in the hands of a group of corporate recovery specialists. The London Weekly News series is still up for sale. Makes some sense now why Street Runners got involved with buying the other titles seeing as they deliver all of them and these as well. I’m guessing like most of the larger nationals they wouldn’t have dreamed of actually putting these out for sale. Although with today’s TUPE laws who would want to necessarily buy them! Indeed it was Karl Kolchack which is sometimes why there has to be moves at the top with the old guard stepping down so the new regime can make the kind of cuts savings and ‘ efficiencies’ the previous chiefs wouldn’t want to have their name .associated with. Wasn’t Sir Ray’s boast that the company had never made anyone compulsorily redundant, rather than never having closed a paper? Sad and final curtain for a long-established North London weekly with a great tradition. The Barnet Press was launched in June 1859 by George Wetton Cowing, acting as editor, reporter and printer. When I joined as a junior reporter in 1966, it was still a family owned newspaper and his great grand-daughter, Miss Gwyneth Cowing, presided over the House of Cowing. At Christmas we formed an orderly queue for our annual bonus, cash in a sealed envelope. The original office, with its distinctive outside clock face, still stands at 118, High Street. It’s now a bank. There was also a Potter Bar Press edition. Many great talents got their start in journalism at the BP – John (Match of the Day) Motson, was a cub reporter and sports writer; John Sarr went on to cover the Vietnam war for Life magazine. More recently Victoria McDonald, Channel 4 TV’s health correspondent, joined as a trainee reporter in 1984. Great editors like Doug Plank and L.J. Gayleard will be remembered by those old enough! The paper went from broadsheet (printed on the premises) to tabloid in 1984. By then the Press Gazette Group included The Enfield Gazette Series, the Chestnut and Waltham Telegraph and Finchley Press. By then I was promoted from deputy group editor to editor of the Barnet Press series. But the writing was on the wall. I left a year later as budgets and staff were being cut. A few months later the paper moved out of the High Street and endured the usual scenario of changed ownership and more cuts. In April some 50 or more veterans from the good old days attended a re-union organised by former sports editor Roger Jones, later editor of the Hackney Gazette. The camaraderie of those days lives on!